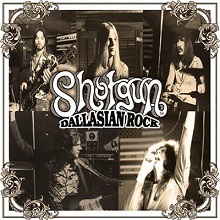 Review: "Shotgun: Dallasian Rock" - Sea of Tranquility - The Web Destination for Progressive Music! Have a soft spot for vintage Doobie Brothers, Foghat, James Gang, Cactus, and Grand Funk Railroad? Can't get enough blistering lead guitar work, instantly memorable choruses, and grooves that just get stuck in your head for hours on end? Then wait till you get a load of Dallasian Rock, a collection of recordings from little known Texas act Shotgun. The folks at ShroomAngel Records have painstakingly remastered a full 1976 recording session, as well as a host of demo & live bonus tracks, to give this exceptional band the 'offical release' they never had. Though Shotgun proved to be a popular act on the Dallas-Fort Worth club circuit, mainstream success evaded them, and after listening to Dallasian Rock you'll wonder just how the hell that ever happened. This is incredible material that should have been huge back in the day, and the amazing thing is it still sounds fresh and exciting here in 2014. The ShroomAngel team have done a wonderful job on the remastering, so be prepared for a killer listening experience. Shotgun were Guy Houston on drums, Hugh Coleman on bass, John Michael Soria on lead guitar, Russ Skarsten on keyboards, and Billy Metcalf on lead vocals. Though they only had a run of a few years, it sounds here like a band that had been together for much longer, a well oiled machine that is firing on all cylinders. Two energetic heavy boogie numbers kick things off, "Rock Star Queen" and "In the Music", each one full of hooks and addicting grooves. "Seems Like You Would Understand" wouldn't have sounded out of place on an old James Gang album, with Metcalf's vocals falling somewhere in between Tom Johnston of the Doobie Brothers, Grand Funk's Mark Farner, and Joe Walsh. Lots of hard rock/funk guitar licks, tasty keyboards, and tricky rhythms on this one. "Play The Game" again has that early '70s Doobies sound down quite well, the funky keyboards and heavy riffs supporting those soaring vocals quite nicely. The atmospheric rocker "Last Night" is another catchy piece, again reminding of Walsh era James Gang, while the raunchy "Mercy" ups the hard rock ante, complete with sizzling licks from Soria. There's more of an atmospheric blues feel to "Feelin' Good", but I love how the band throw in these wonderful vocal harmonies that almost come from a different planet (reminds of Styx) to add plenty of uniqueness to the song. "Straight Out" again takes us down James Gang avenue, this time the Tommy Bolin era, and you could actually say there are some Deep Purple Come Taste the Band styled flavors going on here as well thanks to the swirling keyboards, bluesy vocals, and stinging guitar licks. A fine, fine song. "Keep A Steady High" is straight forward, hard rockin' boogie, and the title track is a just a solid example of catchy, '70s hard rock & boogie, a tune with a great hook that should have seen radio play back in the day. The regular part of the album ends with the moody, almost prog-meets-Southern Rock track "Leavin' On A Train", as atmospheric & melodic musical passages mix with scorching slide guitar and heavy riffs, Metcalf again impressive with some powerful vocals. If you love those blazing slide guitar runs of the late Rod Price of Foghat, check this tune out. I have to mention again the great sound quality of these songs-a killer job was done on the remastering here. That takes us over to the wealth of bonus material included on Dallasian Rock. Most of the demo tracks were recorded in 1974, and feature earlier songs that are no less spectacular in reality, probably more in the Southern Rock & Boogie vein but the talents of the band still shine through. "We Are the Stars" has a certain Foghat or Lynyrd Skynyrd flair to it, and "You Won't See Me Again" again ups the boogie ante, with driving riffs and organ really moving this upbeat piece. Mournful slide guitar and a rootsy vibe permeate the Southern Rock styled "Cold Sunday" (lots of Lynyrd Skynyrd, Allman Brothers Band, and Marshall Tucker Band elements here), while the heavy rocking, guitar/organ barn burner ""I Never Wanted You to Know" is a must hear for all the Deep Purple and Uriah Heep lovers out there. The band dives into prog rock on the dreamy "The Way It's Supposed To Be", as lovely keyboard textures from Skarsten and some tasty Carlos Santana/Mick Taylor styled lead guitar work from Soria just infiltrate your brain. A great song. "Silver Bullets" is another Purple/Heep influenced heavy rocker featuring big guitar & organ riffs...this is early '70s heavy rock baby! The few live tracks are also quite good, with "I Know What You're Saying" being another great early song, a groove laden Grand Funk Railroad styled thumper that sees Soria delivering some scalding riffs & solos. A few of the other tunes are also pulled off spectacularly by the band, showing that their intricate songs transferred quite nicely to the stage as well. Dallasian Rock comes housed in a wonderful digipack complete with plenty of live photos, making this an extremely attractive package. It's also available on LP as well (minus the bonus tracks), so pick your choice, but either way this is astounding stuff from a band that, quite frankly, should have been a household name back in the '70s. Looking forward to hearing this CD. How can I buy it?